Sunday mornings are lazy mornings in this house. We get up late, stay in our pyjamas, make coffee and start breakfast. 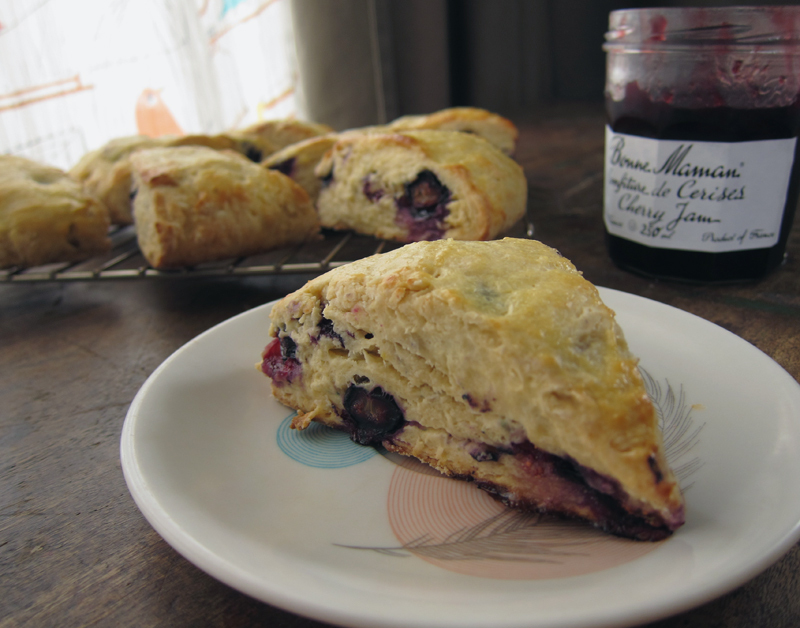 Sometimes it’s pancakes, or waffles or eggs, and once in a while, I make scones. Usually, we eat at the kitchen table and do a crossword, but I have to admit that lately, we’re pressed into the couch watching a totally goofy but super fun tv show from the 60’s – The Prisoner . If you haven’t seen it yet, I highly recommend it. I saw it years ago when my old roommate was obsessed with the show, along with the main star. She bought a few VHS copies that we’d watch over and over again in our cable-less apartment. But I’m introducing this stylish, crazy spy show to the husband and I have to say, all the mod stripes and pops of colour seem to make a lovely weekend breakfast companion for rainy spring Sunday mornings. 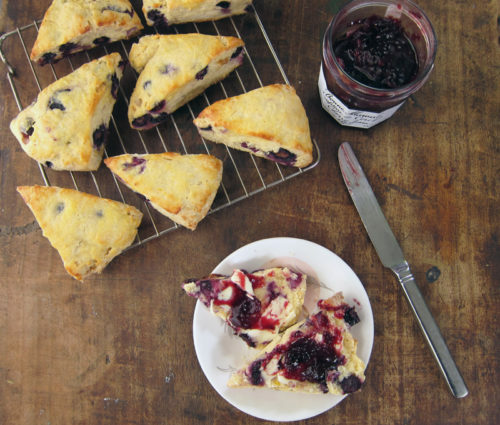 And luckily, so do these scones. They’re buttery with a good crumb and not only do they have a delicate lemony bite, but the blueberries make these nice and jammy. Don’t worry if you don’t have fresh blueberries yet. I used some frozen blueberries from last summer and it worked out perfectly. No need to thaw! The dough comes easily together, just stir the wet into the dry with a wooden spoon. But I have to say, my most favorite part of scone making is when you dump the dough onto a floured surface and give it several pats and pushes. 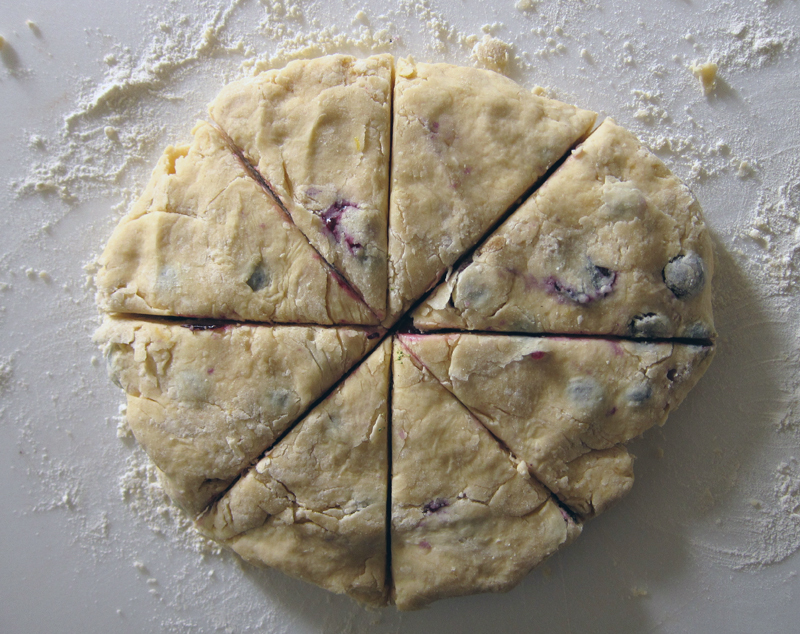 The dough feels cool and good in your hands as you turn it into a flattened circle. Then comes the satisfying feeling when you rock your knife across the surface to divide the dough into triangles. Small joys! And then, out of the oven, you let them cool down a bit. Just a bit because a warm scone is really the prize of the Sunday morning ritual. A schmear of butter and jam too, please. In small bowl, whisk the buttermilk and the egg together until frothy and set aside. In a large bowl, blend the flour, brown sugar, baking powder, and salt. Add in the lemon zest and stir with a fork to mix. Add the butter and blend the mixture with your hands until you have no lumps larger than a pea. Add the blueberries and toss about until the berries are coated with the flour mixture. Pour almost all but 1 tablespoon of the egg/buttermilk mixture and use a wooden spoon to slowly mix the batter until the dough comes together. Leave the remaining egg mixture to brush on as glaze. 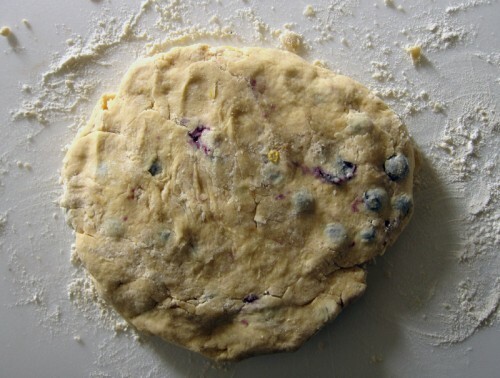 Dump the dough out onto a lightly floured surface and knead it no more than 12 times. Pat dough into a round approximately 1/2 an inch thick, and cut into 8 wedges. Place on an ungreased baking sheet or a Silpat. Using a pastry brush, glaze wedges with remaining egg mixture. Bake for 10-15 minutes, or until golden. Cool on a wire rack. Makes 8 scones. Now that is a lovely sunday morning ritual! So relaxing and full of deliciousness. Oh yes. I have been trying different lemon scone recipes. Have made them with cream and then with yogurt. Not tried buttermilk yet. Blueberries would be a great addition of course! These look delicious! And I have everything in the house to make them. Yummy! Bing and Rainier cherries were all over the farmers’ market this morning. 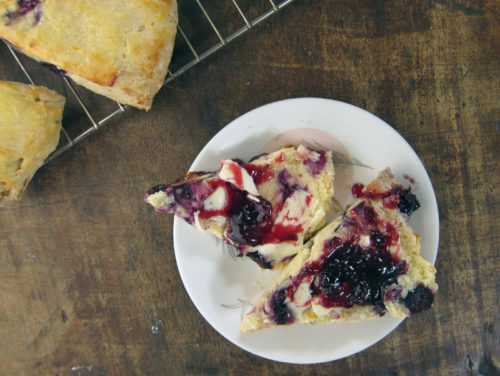 Do you think lemon cherry scones will work? Hope you get to try these out this weekend, Sarah! Rob, yes, you can definitely try them with cherries – I’d just chop the cherries in half since they’re much larger than blueberries. Enjoy & let me know how it goes! My husband recently got the box set of The Prisoner at a charity shop! We haven’t started watching it yet but now you’ve convinced me we need to. 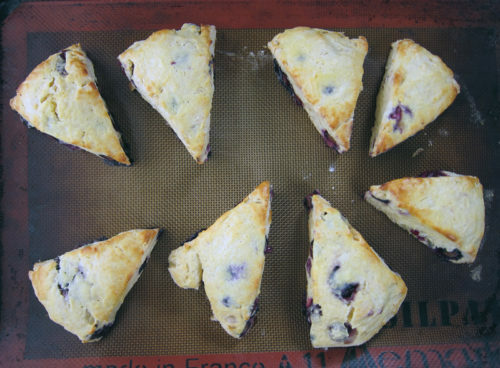 The scones look amazing. These would be perfect in front of the TV on a lazy Sunday morning. I have a bag of frozen blueberries and frozen cherries, so I could potentially use a bit of both for that extra jammy goodness! Getting hungry just imagining the outcome of that. I made these this morning as a Father’s Day treat for my husband. Didn’t have blueberries so I used dried cranberries instead. The scones were delicious and now making another batch for my Dad. Thanks for the recipe – its a keeper. Used orange zest instead of lemon, and put honey butter on instead of jam…so good. Caz, too funny! It’s a pretty silly show & very dated, but that’s all part of the fun. Enjoy! Bijoux, you’re a stronger woman than I! I love bread & I don’t think I could give it up – I’m my happy puffy self 🙂 If you do try the blueberry/cherry mix, let me know how it goes! I’m sure it would be great. Lise, so glad you loved ’em – what a great gift for your dad! I just made these and they were fantastic!! I used milk and vinegar instead of buttermilk. Thanks for a easy and delicious recipe!! So glad you enjoyed these, Jen! !